The Lost Country is a literary journal published by the Exiles Club of Fort Worth. Have a poem, short story, or translation you would like us to publish? What about a critical essay or book review? Our editors are always on the lookout for fresh works from new literary talents. Each winner will receive $200 and a copy of the journal. Awarded to the best poet based on all submissions by each poet. Awarded to the author of the best short story. Awarded for the author of the best essay in literary criticism. All submissions must be received by August 15th, 2016. Please note that while we accept submissions year round, we do not begin to judge any submissions until after the deadline. All works must be submitted through our online submissions form. We discourage submission of previously published works (although we may allow them if the circumstances warrant). We do accept works submitted simultaneously to other publications. The author is required to inform the Editors if a work submitted was selected for publication elsewhere. We read and consider all submissions that meet the guidelines. You will be informed by e-mail within four weeks of the final deadline whether or not your work(s) were chosen for publication. This may or may not be accompanied by any criticism or explanation of the selection committee’s decision. All submissions must be formatted exactly as the author wishes them to be published, including: capitalization, punctuation, line breaks, indentations, etc. Upon acceptance, the editors reserve the right to suggest changes, especially typographical, conformity with which will determine whether the work will be published. The selections committee may determine to publish a work in a subsequent issue of the journal. If this decision is made we will inform you, and you may choose to decline. All submissions must be accompanied by a separate document that includes the author’s full contact information, including: full name, desired pen name, e-mail address, mailing address, and phone number. Please include a one-paragraph, approximately 50 to 100 word note about yourself, including any of your academic and/or professional credentials you would like to supply. Some personal information is acceptable, but please refrain from including a profuse amount of intimate personal details. Upon acceptance, these will be published in the journal in the “Notes on the Contributors” section. Each published author will receive a free contributor copy of the journal. Non-US authors may be asked to pay the cost of shipping to receive their free issue. All works accepted will be published online (issn 2326-5310) and in Print (issn 2326-5302). All rights revert to the author upon publication. 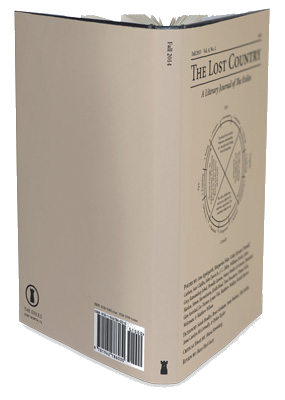 The Lost Country does not grant monetary awards for publication at this time. The length restrictions for all genres below should be considered rough guidelines for what we're looking to publish. If you have a poem of 157 lines you would like to submit, we will still read it; however, anything radically under or over the limitations will not be considered. We accept poems of up to a maximum of around 150 lines. Short fiction is limited to approximately 5000 words. Please refrain from submitting works which include a profuse amount of explicit violence, sexual content, or language. We generally do not accept 'flash-fiction'. We do accept portions of longer, even uncompleted, works so long as the portion or chapter submitted is self-contained and able to be beneficially read on its own (e.g., no cliffhangers). We do publish fiction serially; however, we will only accept submission of completed works to be published serially. Each portion should follow the length guideline for short fiction above. You may include notations regarding suggested breaks in the text, though upon acceptance the editors reserve the right to consult with the author on both the number of portions and where they will break. We accept translation of important literary works of up to a maximum of around 1000 words. Please include the original text of the work being translated. We accept critical essays of any length. Essays are limited to “classic” works in the Western literary tradition and essays on literary theory considered in general. They should be scholarly in nature and cited according to a recognized academic style guide (e.g., MLA, Turabian, Chicago), including a Works Cited page, if applicable. We express a preference for book reviews of new literary works, ideally published within the last five years, though we may allow reviews of older works in special situations. Reviews should be around 500-1000 words. Please include information about the book reviewed, including: author's or authors’ name(s), full title (including subtitle, if applicable), series title if any, place and date of publication, publisher's name, number of pages (including front matter), and retail price.